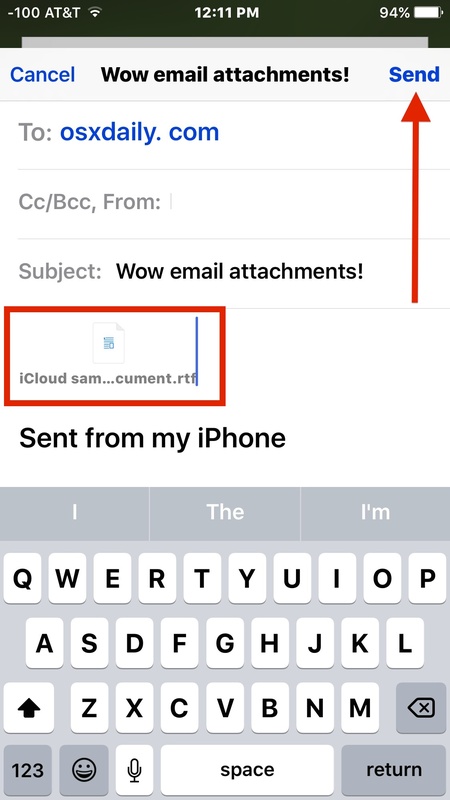 Mail app in iOS allows users to easily add any type of file attachment to an email, as long as the attachment in question is coming from an associated iCloud Drive. This means you can add files from Pages, Microsoft Office documents, PDF, PSD, text and rtf files, or just about anything else, directly to an email on the iPhone, iPad, or iPod touch. The selected file(s) will behave just like a regular email attachment sent from a desktop email client too. 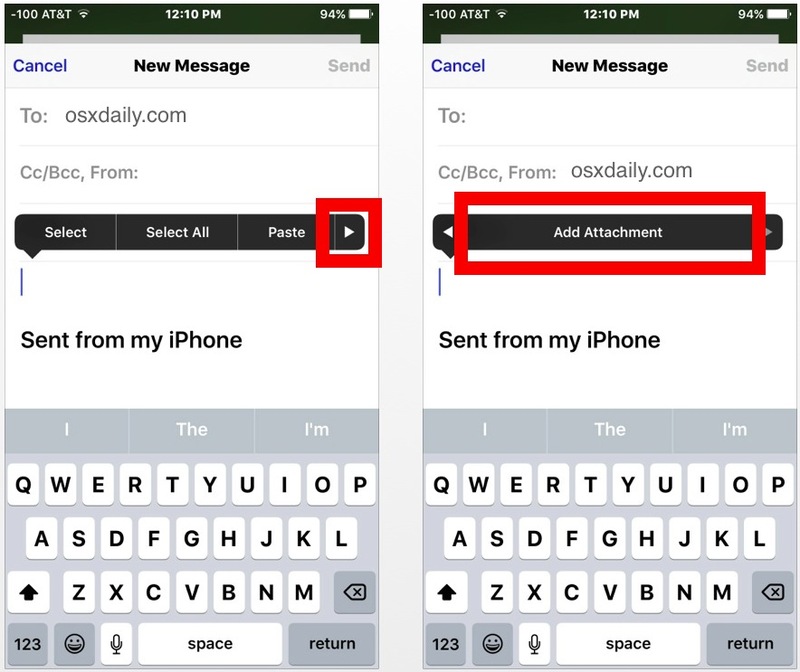 Let’s walk through the steps for how to add attachments to emails in iOS. 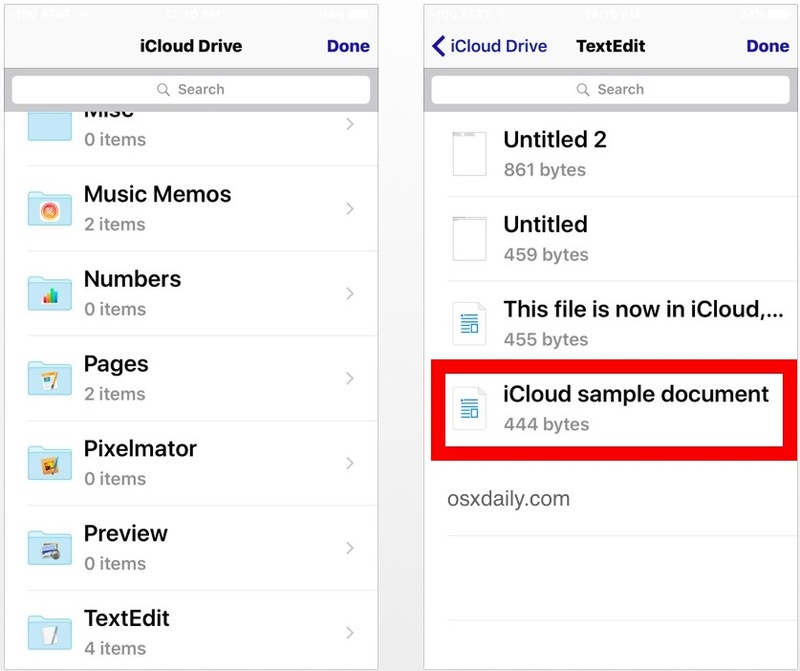 This ability requires iCloud Drive in iOS to use as described, which means the files you can attach to the email must be stored on iCloud Drive, either through an app or if you have copied them there manually from a related Mac. You’ll also need to be running a modern version of iOS, anything after the 9.0 release will have this ability. Without iCloud Drive you won’t have access to the file attachment feature, but you can still attach photos and videos to emails as usual. The chosen file actually attaches to the email, just like it would from a desktop email client. This assumes the attachment is an appropriate size, as a large file sent through Mail will offer an iCloud Mail Drop link when sent from iOS instead. If you’re on the receiving end of an email attachment in iOS, you can choose to save the attachment to iCloud Drive, or in some cases you can save the attachment to iBooks if it’s a file that can be ready by the program, like a DOC or DOCX file, PDF, or text document. 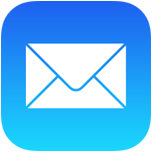 If you send and receive many email attachments from an iPhone or iPad, you may want to enable an Attachments inbox in Mail for iOS which makes it easy to view only emails with attached files. This is a pretty easy way to attach files to emails in iOS, though it’s not quite as quick as the drag and drop method for Mail on Mac, where you can simply drag a file onto the Mail icon to compose a message with said file attached to a new email. Email attachments are a huge part of business and work. Why is this so complicated? Why does it require iCloud? What if we don’t use iCloud for files and only for storage? Tough luck, no attachments for you on the iPhone or iPad, or the iPad Micro iPod Touch. And, as if adding attachments to your emails could be any more difficult or unusual, Apple dreams it up and implements it, in multiple completely different forms, on the same OS, depending on the size of the screen you have. You have to love the inconsistency from Apple throughout their iOS (which must stand for immatureOS) experience. On iPhone and iPod, you tap and hold and then tap on some buttons until you see what you want. On the Big iPhone Plus Huge S Edition, you may or may not see it initially, depending on if you have the Big Plus Huge Zoom display enabled or not. Then, as Luis describes, on the iPad, you tap on a paper clip icon (why a paper clip that is used nowhere else in Apple world? Who knows!). Then on the Mac, you drag and drop, or use the menus. The Mac is still the best platform, for all the woes that are OS X, it is the most usable, despite Apple trying their hardest to break it so we all move to the woefully inadequate and terrible iPad experience [[oh sorry now it’s called iPad Pro because they wanted to riase hte price $100]]. The iPhone is good, but it has become overly complicated by the increasingly poor user experience of immatureOS 7+ release that is a huge guessing game, and far beyond the realm of the average Apple user. Sorry, I am ranting, but it is frustrating. I couldn’t have said it better myself. I have a love hate relationship with Apple. I so wish I could simply plug my phone into my computer and drag and drop files too. Again, not that simple. It doesn’t require iCloud. Attachments can be retrieved from other Apps. In the step after you click on “Add Attachment” there is a menu link in the top left named “Locations”. Here you can browse to other cloud services such as Dropbox and OneDrive. Note: This is probably iOS version specific – I’m running 9.3.1 on all my devices. I don’t have info on when this feature was added or if it was always there since the “Add Attachment” option was available. It may also depend on which other cloud service apps you already have installed. I can attach files from other cloud services such as Google and Dropbox. When I get the iCloud Drive browser window, at the upper left tap “locations” and you can select the other services. l have iOS 9.3.1 — maybe that’s why I have this ability? This is not limited to iCloud Drive, it also works with Dropbox, Box, OneDrive and Google Drive. If any of these are installed on your iDevice, simply tap on the “Locations” label on the top left of the iCloud Drive file selection window. Then tap on the name of the provider that you want to access, and then select your file. When I say Add Attachment. There is nothing in my iCloud. I have linked everything that I know of, but the screen is blank. Help! I want to attach a photo NOT embed it in the body of a Mail email. When I click on “add attachment” no photos are in my iCloud Drive yet if I click on the “embed” option all my photos are there. Is it possible the “attachment” 0ption does not work with photos? Tap & hold doesn’t work for me. The attachment menu does not reveal itself. Any other suggestions? Thanks.